This involves the carving of intricate and detailed designs on the areca catechu betel nut. The subject matter ranges from popular deities to figures of animals and symbolic emblems. There is a strong element of religiosity in the carvings and figurative representations of gods and temples abound. Another range consists of jewellery and other bric-a-brac. Beads, rings, and other ornaments are common as are more utilitarian objects like key chains. Owing to the nature of the betel nut, the final product has an interesting speckled look. Dry betel nut of the size required is cut with a vice into different shapes and sizes depending on what it is to be crafted into. The craftsperson holds the cut betel with forceps and engraves it with a specially designed needle called munna, which is available in various sizes and thicknesses. A sharp-edged knife called tagi is also used. The engraved pieces are then filed and joined together where necessary. Some craftspersons use a small motor attachment to make the work easier. The product is then varnished. 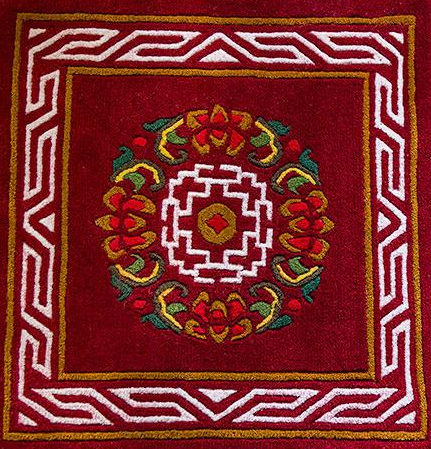 Known as the karungar, this craft was originally practised in Jaipur (Rajasthan). In fact, it was mentioned in the cataloguing of products for the Glasgow International Exhibition of 1888. It has, however, almost died out in Jaipur and is now practised only in small pockets.